Figure 6.3. (A) κ (white) and λ (grey) sFLC concentrations and (B) κ/λ sFLC ratio in CKD stages 1 – 5 plus patients on peritoneal dialysis (PD), haemodialysis (HD) and controls (Con). Data presented as box plots (1st – 3rd inter-quartile ranges, central line is median value) with whiskers (5th – 95th percentile values). (Courtesy of Colin Hutchison). Figure 35.2. Survival by quintiles of ΣFLC levels for 848 patients with chronic kidney disease. (Reproduced from with permission from Elsevier). Chronic Kidney Disease (CKD) is considered to be a major public health problem and it has been estimated that more than 10% of the adult population are affected to some degree . Reduced clearance of sFLCs results from an impaired renal glomerular filtration rate (GFR) and is a frequent finding in CKD. This can be seen even in apparently healthy individuals who may have elevated polyclonal sFLCs from a slightly reduced GFR. 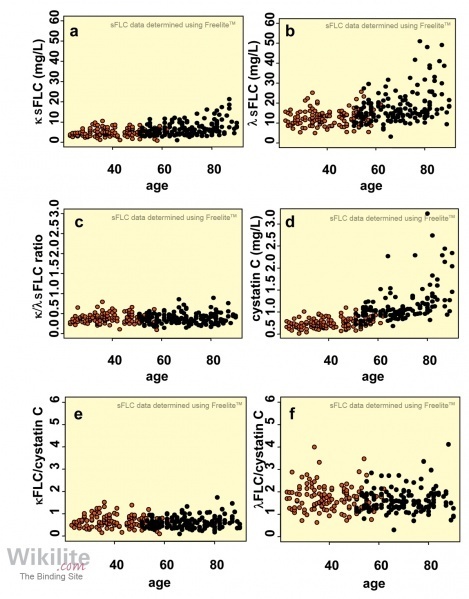 This was first observed in elderly subjects when deriving the sFLC reference ranges (Figure 6.2). Reduced renal clearance of sFLCs leads to a preferential rise in κ sFLC (and hence the κ/λ sFLC ratio). The mechanisms of sFLC clearance are described in Section 3.5 and the derivation of a renal reference interval for the altered ratio is explained in Section 6.3. Hutchison et al. analysed sFLC concentrations in 688 patients with CKD of varying severity. Higher sFLC concentrations were associated with more advanced CKD (Figure 6.3), and the concentrations of both FLCs were correlated with other measures of glomerular filtration (Table 35.1). There was also a correlation between CKD stage and urinary FLC excretion: urinary FLC concentrations and FLC/creatinine ratios increase as estimated GFR (eGFR) decreases . Fenton et al. hypothesise that as nephrons are lost, there is hyperfiltration of the remaining functional glomeruli and increased concentrations of FLC in the glomerular filtrate that exceeds the capacity of the proximal tubule to reabsorb and metabolise them. estimated GFR (eGFR), and cystatin C in CKD . eGFR calculated using the Cockcroft-Gault formula . Hutchison et al. subsequently showed that the sum of κ and λ sFLC concentrations (ΣFLC) was raised in 848 CKD patients and inversely correlated with estimated GFR (eGFR). Outcomes for these patients were monitored (median follow-up: 63 months) and elevated ΣFLC was a predictor of mortality (p<0.001) independently of all other factors, including renal function and CRP concentrations (Figure 35.2). 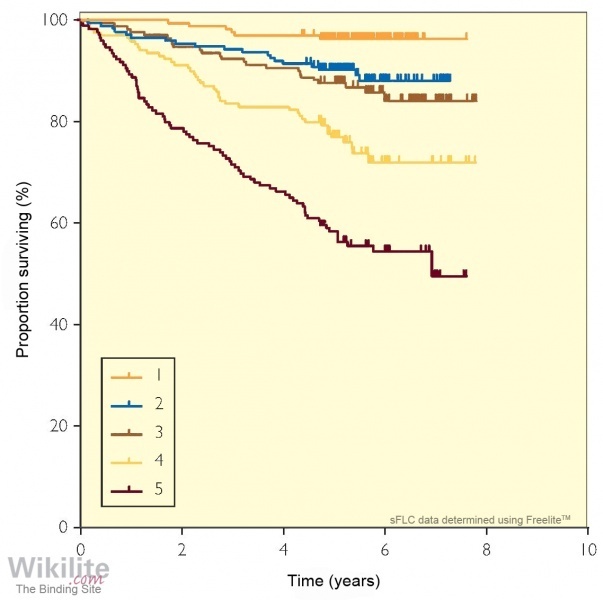 Similar associations of ΣFLC with survival have since been reported in other studies . Together these studies represent CKD patients with a range of disease severity, including those with moderate impairment monitored in primary care  and those with more significant impairment under specialist nephrologist care . Such studies, and others, were recently included in a large meta-analysis by Fraser et al., with a combined total of 3680 patients. On multivariate analysis, and taking renal function into account, an elevated ΣFLC concentration (>43.3 mg/L) remained independently associated with all-cause mortality (hazard ratio 1.45, p<0.001). The most frequent cause of death in CKD patients is cardiovascular disease , which is independently associated with elevated sFLCs (Section 35.3) and could partially account for the relationship. Consistent with this, Hutchison et al. reported that elevated concentrations of ΣFLC were associated with death due to cardiovascular causes in their CKD population. The meta-analysis by Fraser et al. also highlighted the association between elevated ΣFLC and an increased risk of progression to end-stage renal disease (hazard ratio 3.25, p=0.01). Whilst monoclonal FLC deposition in kidney tubules is frequently seen in multiple myeloma (Chapter 27), AL amyloidosis (Chapter 28) and light chain deposition disease (Chapter 29), polyclonal light chain deposition is rarely observed. However, Basnayake et al. found polyclonal FLC deposition in renal parenchyma in CKD. Parasuraman et al. investigated biopsies from 33 patients with renal disease (but no clonal FLC) and reported significant polyclonal FLC staining in proximal tubules and glomeruli. The FLC deposition was correlated with loss of the brush-border and interstitial fibrosis. Thus, it is possible that polyclonal FLC deposition may contribute to the progression and poor outcomes seen in patients with CKD.